What do Robert Redford and a couple of big name universities have in common with Domestic Terrorists? As it so happens, one is hiring them; the other is making movies about them. The movie, entitled “The Company You Keep,” film stars Robert Redford as a former Weather Underground militant hiding his identity from the FBI. Redford also directed the film. Time Magazine continues, “they moved into collectives, practiced forced sexual rotation, took weapons training, and planned attacks on the wealthy and powerful.” And attack, they did. From bombing the Pentagon, Army recruiting stations and the U.S. Capitol among others, to staging the Days of Rage in Chicago, the group was militaristic and guerrilla-like and they meant serious business. At one point, a group of SDS members traveled to Cuba to learn from one of Communism’s most infamous leaders, Fidel Castro. One member of the SDS group had quite the connection to the Castro regime- her father, a lawyer and a self-proclaimed Marxist, provided legal counsel to the Cuban dictator. A founding member of the group was William Ayers, a man whose relationship with the president was the subject of great scrutiny during the 2008 election. It was, after all, Mr. Ayers with whom Barack Obama crossed paths many times early on in his political career; even attending a gathering in Ayers’ own home. In addition, Obama sat on several boards that “granted nearly $2 million dollars to Bill Ayers’ Small Schools Workshop.” Whether or not Ayers directly guided Obama’s career is still somewhat unclear, but the societal circles in which the two men found themselves certainly suggests that at minimum the president was sympathetic to his overarching ideology. Obama understandably tried to distance himself from the former Weather Underground radical, excusing away his actions by virtue of the fact that they happened a long, long time ago. “…somebody who engaged in detestable acts 40 years ago, when I was 8.” the president is quoted as saying. So, with this we are to understand that Bill Ayers has rejected his radical past? Not surprisingly, the president lost the support of the wholly unrepentant domestic terrorist, who recently sent the president a fairly stern letter. . . because apparently he’s just not left-wing enough. The mayor of Chicago Rahm Emanuel (former Obama White House Chief of Staff) received similar criticisms in an interview during which Ayers calls Emanuel a “right-wing troglodyte.” In other words, the very left-wing Rahm is a conservative living out of touch with reality. Somehow, despite these and many other such displays of hatred and violence, Robert Redford’s promotional interviews highlight a “more than sympathetic” view of the radicals’ modus operandi. In fact, in one such interview he shares that he empathized with the Weathermen, and that he “was very much for what was going on.” While Robert Redford probably won’t see any consequences for his outspoken beliefs (we do, after all, have 1st Amendment Rights), how has Bill Ayer’s able to avoid to evade serious consequences in spite of his active role in the terror? Despite this, he did hit a bit of a bump in the road when, after retiring, the University of Illinois refused to grant him emeritus faculty status. “Dr. Kathy Boudin has been an educator and counselor with experience in program development since 1964, working within communities with limited resources to solve social problems, and supporting individuals to overcome their own odds and develop a sense of strength and direction. Dr. Boudin has focused her work on the HIV/AIDS epidemic, and criminal justice issues including women in prison; mother-child relationships and parenting from a distance; adolescent relationships with incarcerated parents; restorative justice, and higher education and basic literacy inside correctional institutions. It seems that Columbia has found it acceptable to refer to a violent past as “working within communities with limited resources to solve social problems, and supporting individuals to overcome their own odds and develop a sense of strength and direction” these days. ROBERT REDFORD: … When I was younger, I was very much aware of the movement. I was more than sympathetic, I was probably empathetic because I believed it was time for a change. Whether that change was a revolution or not, I don’t know. But I was very much for what was going on. STEPHANOPOULOS: Even when you read about bombings? REDFORD: All of it. I knew that it was extreme and I guess movements have to be extreme to some degree. Years later I thought this is an interesting story but we’re too close to it and I thought, when this gets– when we get some distance from this so that we can look back on it as a piece of American history then I might be interested and now that’s the time. So that’s why I decided to make it now. STEPHANOPOULOS: Do you come out of the experience with the same kinds of empathy that you had going in? REDFORD: Yeah, I’ve bled a little for those that look back and realize what they did in their youth when they were full of passion and intensity that subsides over time. But the only thing that sticks is the thrill of that moment, the thrill of that movement when they were committing all of themselves to something they believed in. “Empathetic” towards the actions of people who kept company with Fidel Castro, praised Charles Manson, and bombed the Pentagon? The “thrill” of the movement in which innocent people died at the hands of still-unrepentant murderers? While Redford brushes off this behavior as nothing more than the fiery passions of youth, remember- the members discussed here today have yet to repent for their deadly actions, and instead continue to propagate the same radical ideals in America’s education system. Have we become so numb as culture that the actions of domestic terrorists have become nothing more than nostalgic “freedom-fighting” lore of days gone by? Have we become so deadened to radicalism that the fact that our now-president openly worked with and supported the work of none other than Bill Ayers? Rather than gracing Redford’s quasi-tribute to Weather Underground with your presence, spend the ninety minutes to research the professors at the universities and colleges where your children plan to or currently attend. To be sure, freedom of speech and the freedom to believe as one chooses is part of who we are. Despite this, ideologies that call for the death of fellow Americans and the violent destruction of our institutions simply cannot be tolerated, and their eradication is imperative if our nation’s future is to remain secure. 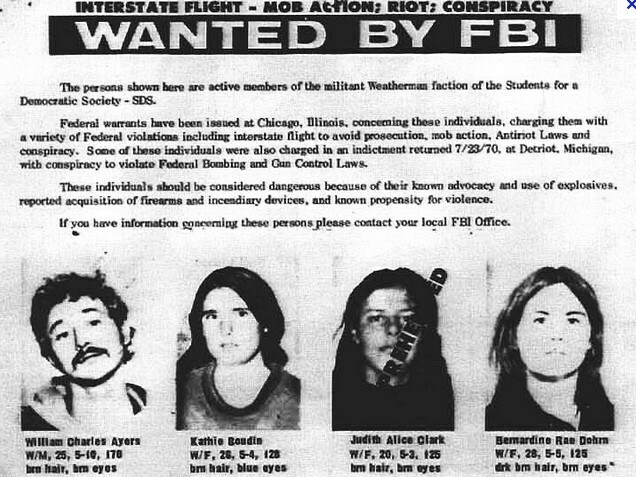 We must raise the next generation of Americans to recognize people like Bill Ayers, Bernandine Dohrn and Kathy Boudin for the unrepentant terrorists they are; only then can the quiet spread of their violent radicalism be staved off for good. So well written, it brings back memories. All I can add is a little bad “coffee house” poetry. The SDS was the AIDS, to the HIV, of the Universities, of the 1960’s. When my generation dies off, it will not be too soon. I shudder to think of people–like Redford; like our President–who see no wrong in what these people did. This is more than simple political disagreement- so much of what they did was wholly demonic. I pray that Redford’s movie is a flop (which it sounds like it might be- I’ve heard absolutely NOTHING about it) and that people are awakened to what their children are being taught in school, and by whom. This, coupled with the things you’ve pointed about about Islamic radicalism being swept under the rug in American academia is frightening!